An exersaucer is like a walker without wheels. It stays put with a huge activity center that your child may play with while inside the exersaucer. It is somewhat similar to a jumpero﻿o as well - except for the bouncy part of it. Let's talk about the good things about an exersaucer first. 1. Great Entertainment. It is a great way to entertain our little ones since it has plenty of toys to play with and a lot of things to touch and be crazy about. Your baby ends up becoming fuss free with this baby toy. 2. Good for Motor Development on the knees and toes, and upper limbs. It does help promote the knees and the toes to hop, jump, and tip toe. Your child is also encouraged to reach, pull, and tug on the toys while inside the exersaucer. 3. Exersaucer toys are interactive and developmental to the senses. With so many colors, shapes, and textures, it's no wonder your little one is very entertained. Considering many other things, an exersaucer has its cons too. 1. Takes up too much space. Let's face it. It's a huge toy especially if you are a bit tight on space. When you have a wider house to have your child play around with it, then it's fine. 2. Not good for your baby's bones and muscles if in it for too long. An exersaucer is only meant to be used not more than 30 minutes. It does not promote good health for the hips - as it may cause hip dysplasia - and it can also affect the spine as well. So, overexposure to an exersaucer will not be a good thing. We are all guilty of one thing in getting an exersaucer: having it as means to give us time to work on other things. However, it does become a babysitter in many ways. It becomes something that we can put our child into with both our hands free. However, we should be careful in letting our child use an exersaucer since a developing skeletal system might be affected in the long run. You need to find something that must be very durable. It has to be strong enough to be brought around from one place to another and also good enough to hold your very active little one. Your baby is very playful at this stage and needs to be kept in safe and secure equipment. This is a major factor to consider. An uncomfortable exersaucer is something that is definitely going to make your child become fussier and more annoying. You don't want anything to make your child feel uncomfortable in any way, would you? The only reason why we are buying an exersaucer in the first place is to keep our little one distracted for a while and a good activity center is one exersaucer feature that we must always have to consider. Colorful and entertaining, this is everything we'll ever want in an exersaucer. It has 11 toys that your child will enjoy playing with. It also has fun music that plays with every touch of the button. This exersaucer also promotes fine motor skills, object exploration, and tactile development among others. The Evenflo Exersaucer is very easy to clean. The pad is removable and machine washable as well. It is also collapsible making it very easy to travel around with or bring it somewhere your baby might need it or for easier storage when not in use. It is also highly adjustable. It has three different height adjustments to accommodate your growing child. It is actually a three in one playhouse for your baby. It starts off as a playmat activity center, an exersaucer, and a play table or activity center for your toddler. Overall activity center from infancy to toddlerhood. This is a very interactive play center. It has 12 unique toys to play with and it includes a piano. The piano has three learning modes: melodies, piano notes, and language learning. The language learning features English, French, and Spanish. The exersaucer seat pad rotates for the benefit of your child. It rotates 360 degrees allowing your little one to reach every toy that surrounds her. This allows full access to all of the toys. The play center also includes a couple of link loops so you can add some toys. The seat is also very comfortable made of 100% polyester. The seat is also sturdy with a padded high back seat for additional comfort. You can remove the seat to wash it in the washing machine. It has 5 height adjustments that really goes well with a growing child. Very interactive activity center with great musical piano notes and language learning area. This exersaucer is very colorful. It also comes with a perky pink version for your dear daughter or an all-around rainbow colored theme for any gender. The activity center is placed well around a compact table. The seat has a 360-degree rotation allowing your child endless access to all of her toys. Aside from the turning seat, the bottom has a bouncing pad that acts like a mild trampoline. This literally serves as bounce-a-round baby equipment. The design is very compact, which is ideal for tighter and smaller spaces. The toys are evenly distributed around the exersaucer. The entertainment center promotes reaching, active bouncing for knee and leg development, hand coordination, and also lets your child practice how to stand up. It is easy to clean with a machine washable seat pad. It also lays flat for easy storage. The exersaucer has 3 height adjustments to accommodate your child as she grows. This unique exersaucer is designed opposite to the typical exersaucers around. Instead of spinning to reach for surrounding toys, this exersaucer goes around an activity center or table. The seat is attached to the seat and goes around the table so your baby can reach for the toys she wants to play with. This promotes better leg movement by encouraging your child to walk around the table rather than spin inside it. The play table I very interactive with different areas that target different senses. It has a music area using piano keys; it also has an eating area that can be detached for easy cleaning. You can also add toys into the link loop provided. The seat can also be removed totally once your child grows older. She can use this as her own play center even long after she's already started walking and running about. This music inspired entertainment center is a treat to behold for all babies. It works in 4 ways beginning with a detachable padded play mat where your little one can enjoy her tummy time. Once your baby is able to sit up, you can already use it as an exersaucer. The exersaucer's seat swivels 360 degrees allowing your little one to reach all of the musical instruments around the exersaucer. 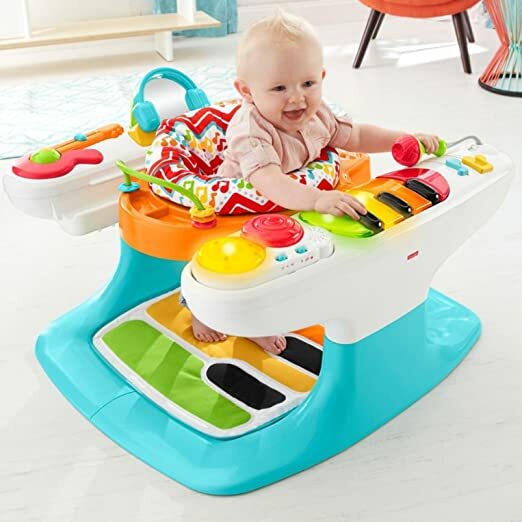 The third stage allows your child to reach and play the piano with this exersaucer working as a stationary walker. And lastly, by removing the chair, it works as a toddler's musical table. Your little one can start playing her own tunes as much as she wants and how she wants it. The piano has three music modes: long keys, short keys, and manual piano playing. Every toy has its own musical note. The piano mat also plays music as it is stepped on; it also includes music note sliders, light up drums, tambourine, guitar with a roller ball and clicking slider, roller ball with music beads, and many more. Some of the toys can be detached for tummy time play. It is very durable and definitely worth the cost. The design is great and the concept is also ideal for children to develop their auditory skills. It is also good for practice before they hit the walker. Cleaning is also a breeze since the seat pad is machine washable and all the rest are simply wipe-ups. ​Getting your child an exersaucer has its cons but it also has its benefits in providing you with an extra hand. However, don't get too used to it and rely on your exersaucer acts as a babysitter. Exersaucers are made to entertain and with that in mind, we only chose the best for you and came up with the Bright Stars Around We Go Activity Center as our primary pick. But still, the taste falls on you and your preference will definitely suit your baby's needs perfectly well.